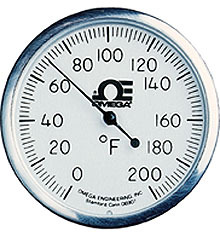 The OMEGA™ Compost Thermometer is ideally suited for monitoring interior temperatures of compost piles and windrows. The clear, easy-to-read dial, with the pointer directly driven by the sensitive bimetal helix in the bottom of the stem, gives an accurate reading every time. These hardy thermometers are used by composters everywhere for such applications as waste disposal, recycling, and mushroom farming.